WASHINGTON (Jan. 27, 2012) -- The Army will draw down in size by as many as 80,000 Soldiers over the next six years. That reduction includes the elimination of at least eight brigade combat teams. 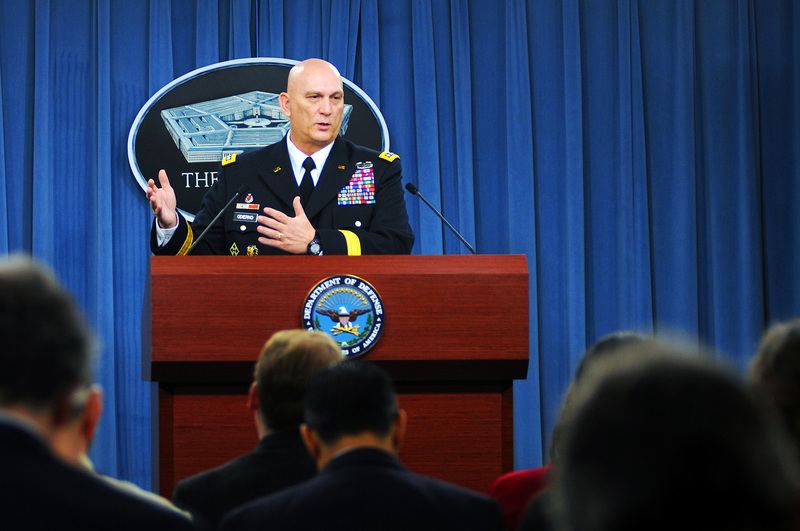 The Army expects an active force end strength reduction from 570,000 to 490,000, said Chief of Staff of the Army Gen. Raymond T. Odierno, during a press briefing, Jan. 27, at the Pentagon. The general said the time is "strategically right" to reduce the Army's force structure, but stressed that it would be done the right way. "Even given a fiscally constrained environment our Army will accomplish our reductions in a responsible and controlled manner," Odierno said. "Secretary McHugh and I are committed to ensuring we walk down this hill at the ready, rather than running our nation's Army off a cliff." Odierno said the Army would execute force reduction measures by following a "drawdown ramp that allows us to take care of Soldiers and families, while maintaining a ready and capable force to meet any requirements, including our current operations in Afghanistan." Most of that force reduction, Odierno said, would come from attrition. Part of the force restructuring will come from a reduction of two heavy brigade combat teams out of Europe that will take place in 2013 and 2014. Odierno said the Army will continue to provide forces on a rotational basis to Europe for training and readiness exercises with NATO and other partners. While the total force end strength would be 490,000 Soldiers within six years, the Army will see an increase in special operations forces, Odierno said. He said the Army will increase those forces to 35,000. "I want to reemphasize the incredible missions and roles that they play and what they've been doing over the last 10 years in Iraq and Afghanistan and around the world," Odierno said. Odierno said the Army's future also calls for a strengthening of security relationships and partnerships in Asia, as well stabilization of growth in personnel costs. "The cost of military personnel has grown at a substantial, unsustainable rate over the last decades," Odierno said. "We will not reduce pay, but reductions must occur on the rate of growth in military compensation and other personnel costs and related benefits." Even with fewer Soldiers and a streamlined force structure, Odierno said the Army would continue to meet commitments in Afghanistan and around the world. "The Army will continue to play a large role in the missions identified in the strategic guidance," he said. That includes counter terrorism, irregular warfare, the deterrence and defeat of aggression, the projection of power, defense of the homeland, support to civil authorities and stability and counterinsurgency operations.